Edinburgh, Scotland's largest city, is one of the world's most attractive and cultural capitals, rich in both historic and contemporary architecture. Although compact, the city is complete in every aspect and boasts a royal palace, a house of parliament, a medieval castle, several historic museums and collections of fine art, plus many beautiful parks and excellent shopping facilities. There are two distinct parts to Edinburgh, the medieval Old Town, which spreads out around the foot of Castle Rock, and the gracious 18th-c New Town, with its broad Georgian streets, squares and circuses. Princes Street is the principal thoroughfare that divides the new and old towns. 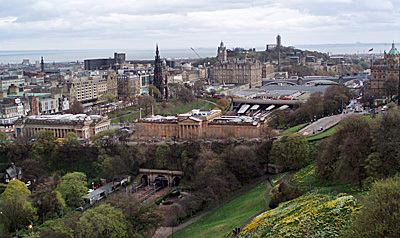 Along the south side of the street stretch the Princes Street Gardens, backed by Edinburgh Castle, which is strikingly situated on a rocky outcrop. The castle's state apartments include the crown jewels of Scotland, the room where Mary Queen of Scots gave birth to James I and several military museums. The castle parapets provide an impressive panoramic view across the city to the Firth of Forth and surrounding hills. 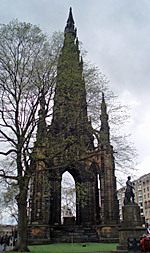 Within the Princes Street Gardens stands the 200 ft high neo-Gothic memorial to Sir Walter Scott. The Edinburgh-born writer famous for his historical novels. Erected in 1844, to a design by George Meikle Kemp, it contains 64 statuettes of characters from Scott's novels, surrounding his central statue. Running down hill from the castle is the cobbled Royal Mile, lined with restaurants, shops and many places of historical interest. Several of its historic buildings are open to visitors, including Gladstone's Land, built in 1620 by city burgess Thomas Gladstone and St Giles's Cathedral. Also of interest near the cathedral is Parliament House, last used in this capacity in 1707. The city's Mercat Cross located in Parliament Square was originally an 11th-c site of execution and the appointed place for reading royal proclamations, which are still read from here to this day. At the end of the Royal Mile stands the Palace of Holyroodhouse. Still used as a royal palace by members of the Royal family on official visits to Scotland. The palace is open to the public except when the royal family are in residence and contains many interesting royal antiquities. There are many other important sights to see in Edinburgh, including the National Gallery, the Museum of Antiques and the Royal Botanic Gardens, to name but a few. 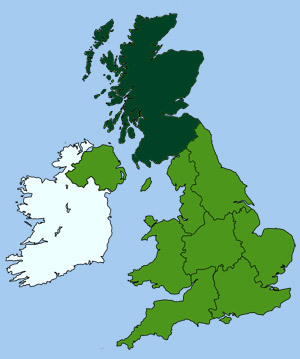 The best attraction of all is the annual Edinburgh International Festival held each August. When the city plays host to the world by offering a spectacular array of concerts, ballet, opera, theatre, comedy and the world famous Military Tattoo held on the castle esplanade. Other areas of note include Charlotte Square in the city's New Town, which is considered to be a masterpiece of Georgian architecture. The Forth Rail Bridge to the north of the city, built in 1890 to span the River Forth, is said to be one of the greatest engineering achievements of the last century. Visitors with enough energy can walk to the summit of Arthur's Seat, which towers over the city and provides magnificent views. Opposite this summit is Calton Hill, topped with a replica of the Parthenon amongst other monuments.